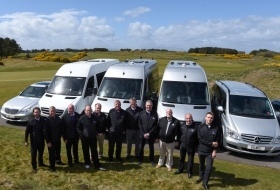 At Henry Golf Tours we work with Ireland & Scotland’s leading transport suppliers. We provide an extensive range of chauffeur drive and self drive transport options in Ireland and Scotland. Our golf travel experts will suggest the best vehicle types, size and options for you based on your schedule and requirements. Your preferred mode of transport will then be incorporated into your customised package with us. Our private chauffeur drive options in Ireland and Scotland are the ultimate in relaxed and luxurious travel helping to make an exceptionally memorable golf vacation experience . 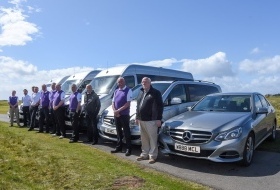 We utilise an up-to-date high quality fleet with qualified and expert drivers. We have vehicle types and sizes available to suit any requirements from couples and smaller parties to larger group bookings. You can also avail of drivers who hold extra qualifications as Failte Ireland certified tour guides. Our fully trained drivers will take you to your airport, hotels and golf destinations in elegance and ease. Experience what Henry Golf Tours of Ireland and Scotland have to offer in the safest most comfortable way with our chauffeur drive tours. We offer self drive car hire options for both manual and automatic transmission types. 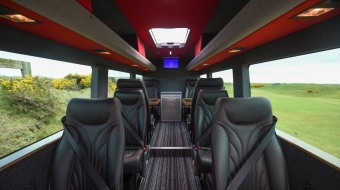 Vehicles are available in a range of makes and sizes to suit a range of traveller’s requirements. Car hire inclusions, booking conditions and upper and lower age limits will apply and in general hire will include Collision Damage Waiver (CDW), Theft Protection (TP), Third Party Insurance and Unlimited Mileage. Additional options such as extra drivers, GPS, extra insurance etc are also available and we can provided you with information and guidelines for driving in Ireland should you require it, please enquire re same. Groups of more than 5/6 persons will require at least 2 vehicles. Options for Helicopter transfers are also available. Want to get in even more golf! Avail of the quickest and most luxurious transport on offer with helicopter travel. Avail of one day or several days helicopter hire as part of your Ireland or Scotland golf vacation. Information and pricing available on request.